Intra League Final 2012: Bad Apples are the Champions! Saturday 2nd June saw Central City Rollergirls conclude their Home Team season with the Bad Apples taking the trophy from last year’s victors with a 181 – 121 win. 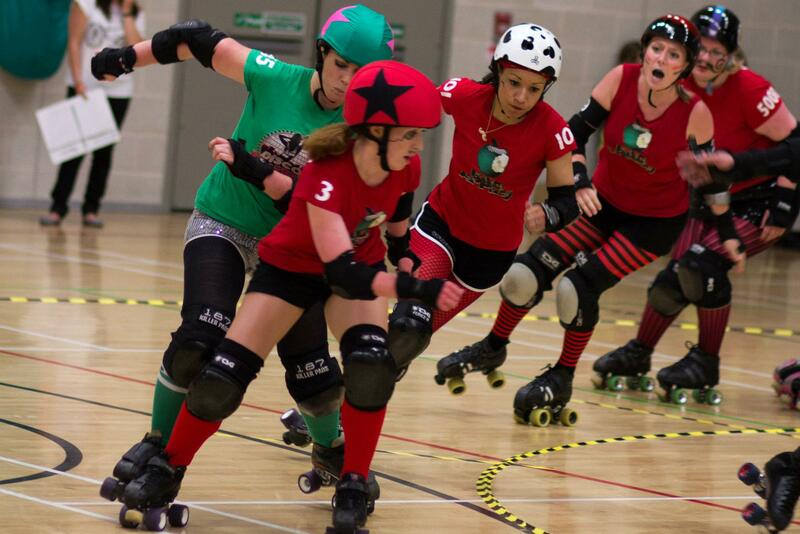 In the run up to the final the Bad Apples and Disco Beaters had experienced seasons which mirrored those of the previous year; Bad Apples winning both their heats, and Disco Beaters winning one heat to meet each other in the final. The Bad Apples were determined to not let the final play out the same way it did in 2010/11 though, and led from the start. 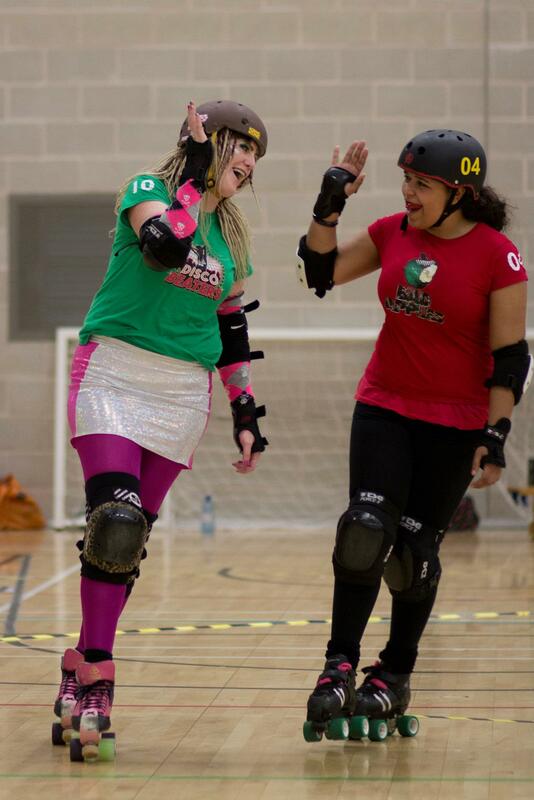 Strong walls enabled Bad Apples to build up a decisive lead throughout the first half, but Disco Beaters were able to take full advantage of a power play in the final jam of the first 30 minutes, making the scores 64 – 106 at half time. In the second half, a couple more power jams, and some effective pack work of their own, the Disco B eaters were able to claw the deficit back to just 23 points, with the scores standing at 139 – 116. However, the Apples got their packs back together to limit the Beaters to just 5 more points in the remainder of the game, with the 60 minutes of play closing at 181 – 121 in the BApples favour. CCR’s 2011/12 Intra-League season has seen some amazing nail-biting games for the three CCR Home Teams, often going right down to the final jam. Bad Apples, Disco Beaters and Queens of Steel now enter the summer break, but will be back in action 2012/13, with their sights set on lifting the intra league trophy this time next year. Don’t miss CCR’s last Travel Team bout of the season with a double header on Sunday 17th June where the Raging Belles take on Evolution Rollergirls and Slay Belles take on Liverpool Rollerbirds. More details are available here. 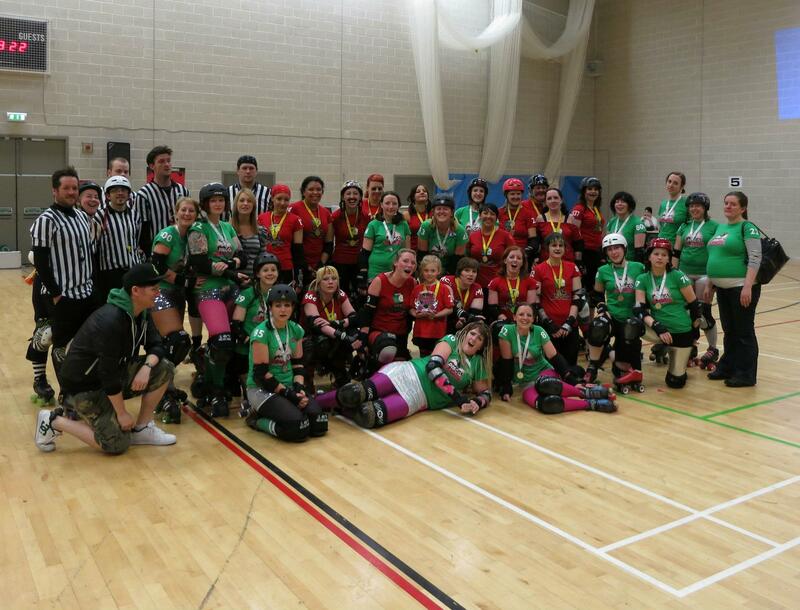 Disco Beaters: 82 Hustle’Her (Captain), 92 Red Gorevette (Co-Captain), 10 Bunny Massacre, 28 Betty Bloodshed, 43 Beth Metal, 44 Nok-turnal, 61 Erin Blockavitch, 85 Lethal Sizzle, 100 Dynomite Bo, 360 XBlox, 429 Thumpalina, 707 Jelly Mean, 737 Speedy Wonder, 808 Pre EMMptive Strike. Line-Up/Bench Manager Ouija Broad.